An over-the-counter or prescription numbing cream, or topical anesthetic, can be applied to your skin before you get a tattoo to dull the pain of the needle. If you have a low pain threshold or are planning to get a tattoo in a sensitive area, you can ask your tattoo artist about using a numbing agent. However, if it's used improperly, a numbing cream can pose a serious health risk, so it's best to talk to your doctor beforehand. Lidocaine, prilocaine, benzocaine and tetracaine are commonly found in numbing creams. Some prescription topical anesthetics, such as EMLA -- eutectic mixture of local anesthetics -- contain a combination of drugs. The topical anesthetic, in the form of a gel or cream, is applied to the skin prior to the tattooing procedure. The cream temporarily numbs the nerve endings in the skin. The cream is typically applied one to two hours before the tattooing procedure, and the numbing effects last approximately 60 to 90 minutes, according to Paul Siscoe, manager of Lady Luck Tattoo & Piercing in Portland, Oregon. Over-the-counter topical anesthetics are also used as pain relief for minor wounds and scrapes, sunburn, insect bites and poison ivy. Some people use a numbing cream before getting a piercing or undergoing a hair-removal treatment. Topical anesthetics may be applied in a medical setting to the affected area before a laceration repair, biopsy or dermatological procedure. The U.S. Food and Drug Administration issued a public health advisory in 2007 regarding the use of topical anesthetics for cosmetic procedures because the products should be used with the supervision of a medical professional. Leaving the topical anesthetic on for an extensive period of time, applying too much or over too large an area of skin or using it on irritated skin can cause the drugs to pass into the bloodstream. This can lead to life-threatening effects, including breathing difficulties, seizures and coma. The FDA recommends using only topical anesthetics that have been approved by the FDA and consulting your doctor to learn how to use the drug safely. 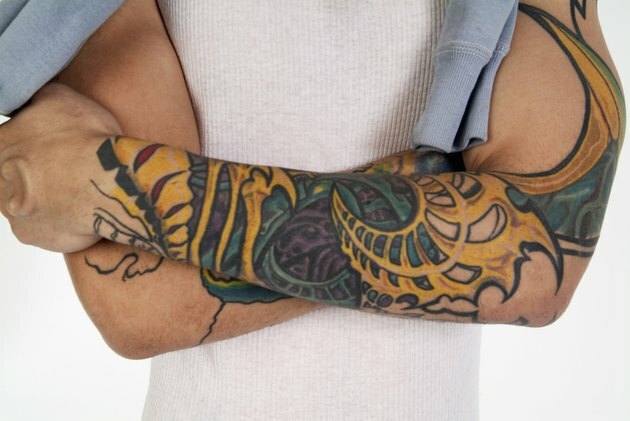 Siscoe states that tattoo numbing creams often aren't as effective as clients might expect, only dulling the pain, but not completely numbing the tattoo area. Eat a full meal and drink plenty of water before your appointment, avoid caffeine on the day of your tattoo procedure and practice deep breathing while you're getting tattooed to help tolerate the pain.